This is a weekly meme hosted by The Story Siren, where we talk about the books we received in our mailbox the past week, or books that we bought, borrowed from the library etc. I got the Norwegian translation of the book and I am going to read it as part of a Norwegian blog tour later this autumn.
" For the first time in his life, Jacob Reckless is afraid. For years he's stolen across to another world. A dark enchanted place he's loved for its treasure, secrets and dangers. Until now. Will, his younger brother, has followed him with terrible consequences: The boy will turn to beast; the girl he loves will break her hert and chaos will rule forever, unless Jacob can spin a fairytale to save them .."
Wow, the Norweigan cover of Reckless is gorgeous! Looks fantastic! Have fun reading this one! I LOVE Cornelia Funke's books- The Book Thief and the Inkworld trilogy. Really want to read this. I'm waiting for this one as well, I'm pretty sure we're part of the same tour. When did you get your copy? It would be great if mine came soon, I like to read the book in good time before my tour date. Hi! I just found your blog! My Husband is Norwegian, and I am from "The Land of The Midnight Sun" (Canada's Yukon Territory is called that!). Anyway... I have enjoyed looking around your blog and I am now your newest follower! You can check out my site and follow me back if you want! Ooh, Reckless! I love the Inkheart Trilogy (well, the two I've read so far), and can't wait to read more by her. Looking forward to hearing what you think of this one. @April: I totally agree with you. I love the cover! @Krystal: I have been wanting to read "City of Glass" for a long time - enjoy it! @Ladybug: I loved "Rubinrød". 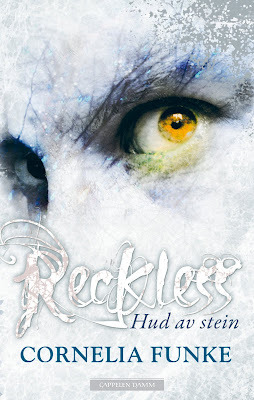 I am so happy that I got to be a part of the book tour for "Reckless". @Steph: Thank you so much, so nice of you to think of me! I actually do not accept awards, I have written about in in my profile on this page. @Pris: You have also got a great blog! @Hilde: Maybe I am gpoing to want to read the Inkheart trilogy afterwards. Thank you for commenting, i love your blog.